RAF Market Harborough was mainly used as an Operational Training Unit from August 1943, throughout its active days with No. 14 OTU flying Vickers Wellingtons, Oxfords as well as Hurricanes and Tomahawks from No.1683 Bomber Defence Training Flight. No.14 OTU was formed in April 1940 as part of No. 6 Group RAF Bomber Command at RAF Cottesmore, Rutland to train night Bomber crews. It was disbanded on 24 June 1945. 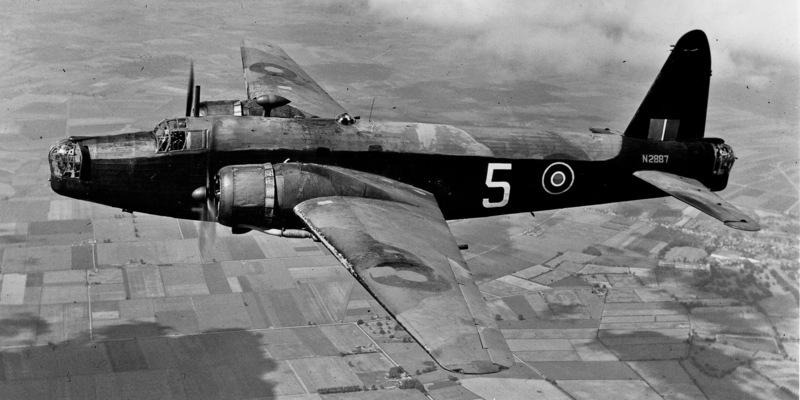 The Lockheed Hudson was an American-built light Bomber and Coastal Reconnaissance Aircraft built initially for the RAF shortly before the outbreak of WW2 and primarily operated by the RAF thereafter. When the British Purchasing Commission went to Lockheed Corporation for a model to support the Avro Anson Aircraft for Reconnaissance duties, Lockheed presented a modified version of the Civilian design Model 14 Super Electra Airliner. The Commission was quickly convinced, and the Military version of the Model 14 went into production with the new designation Hudson. Delivery began in Feb 1939, and by the time the European War started in September 78 were in service with the Royal Air Force, fulfilling Coastal Reconnaissance and light bombing duties. On 8 October 1939 over Jutland, a Hudson Bomber became the 1st RAF Aircraft to shoot down a German Aircraft. During the Dunkirk evacuation, Hudson Bomber acted as Fighters. Some of the Hudson Aircraft also went to the Commonwealth Forces in the South Pacific; on 7 December 1941, one of the RAAF Hudson bombers became the 1st Allied Aircraft to attack a Japanese Ship in the Pacific War when it sank Japanese Navy Transport Awajisan Maru off Kota Bharu. When production ceased in 1942, a total of 2,584 were built. They were withdrawn from front-line service in 1944.